On 28th January 1990, two individuals tied themselves in a relationship called marriage. It was an arranged marriage. It was a beginning of a new journey for them. At that time there was no Facebook so there was no announcement on it. That Guy and girl neither changed their relationship status nor they uploaded the pics of their honeymoon trip. It was a quiet start to their relationship. The guy was a banker and he lived in a small house in the colony near airport with his mother and a younger brother. While the girl was from a big family of four brothers and a sister. The guy had lost his father at very young age so he was very mature and responsible. While the girl had enjoyed her childhood but she was trained well in all the household works. After the marriage, girl started to make a connection with guy's family. She accepted guy's family like her own family. Thus in few months time, girl mixed herself into guy's family like salt into the water. On 24th May 1991, the girl gave birth to a boy and became a mother. After that the couple's bond got stronger. The couple was leading a perfect life but with the passage of time their family was expanding. In few years banker's younger brother got married and in couple of years of that marriage he too was blessed with baby boy. Then on 12th August 1996, banker was blessed with another baby boy. As the family was getting bigger it was getting difficult for them to live together in that small house. So in the year 2000, banker decided to buy a new house but he only had only Rs. 25K for that. He decided to take a loan from his bank to buy a new house. He bought a small house in the same colony worth Rs. 3.5 lacs but that deal got cancelled. The owner of that house changed his mind after taking the token amount. Search for new house began again after that. It ended in the society 3 kms away from that colony. The house in that society was worth Rs. 8 lacs. It was way out of his budget. He took the loan of Rs. 7.5 lacs not from his bank but from other sources. It was the unanimous decision of the couple to buy that house. They bought it and in july 2000, they shifted in that house. It was the biggest test of their relationship. There was huge mountain in front of them which they had to climb. The guy was earning only Rs. 10K per month and he had to pay off Rs. 7.5 lacs. It was a huge amount at that time. The lady had never seen such financial crisis in her whole life. The banker became tensed. He had no idea how long will it take to pay off such a huge amount. Moreover He had responsibility of two children who were in their growing age. The banker lost sleep from his eyes. The only support he had was his wife. The lady stood by him in that crisis and together they started climbing that mountain. They started saving more money by cutting their extra expenses. They made their lifestyle very simple. Banker started doing part time jobs. They saved every penny they could have during that period. With all the hard work and discipline they paid off that money in 6 years. Financial crisis taught them a lot in life and their bond got strongest by the time they came out of it. After that their journey became merrier. In 2013, banker gifted a car to her wife on their 23rd anniversary. Recently they renovated and decorated that house in a way they dreamt of it to be during the crisis. There were other ups and downs as well in their life but those were nothing in front of that crisis. 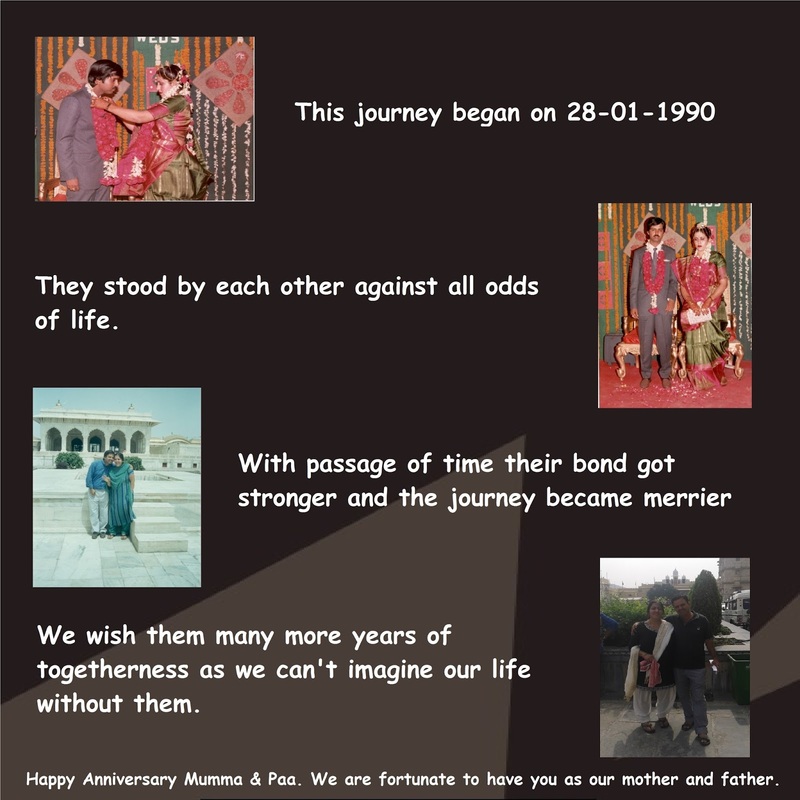 Today they have completed 26 years of togetherness and they are going stronger than ever. Now how I know about this story? Well, I am their elder son. They are the god's best gift to me and there is huge impact of their journey on me and my brother.